"Time to wine about oil." CALGARY — Calgarians' moods may have been dragged down with the price of oil, but that doesn't mean they can't get into shape, find love or — at the very least — enjoy a glass or three of wine. 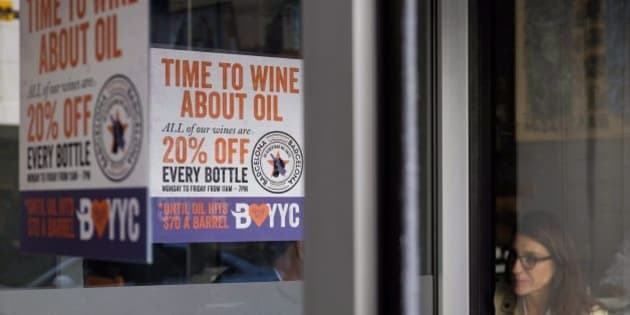 Some businesses in the white-collar heart of the oilpatch have been tapping into the economic malaise with cheeky references to oil price downturn in their marketing. The Lagree fitness studio that recently opened in a posh southwest Calgary neighbourhood recently promoted a "Damn the Barrel" sale, offering to knock 20 per cent off class packages. The ads on social media and posted in its storefront window show a barrel of oil with a downward red arrow through it, with the line "tired of this?" written below it. To the right of the barrel, under an image Lagree's signature exercise machine, is an invitation to "get on this!" Lagree isn't a cheap workout and the studio wanted to "offer some sensitivity" to clients who may be feeling the pinch, said Leonard Seidman, who is in charge of operations and business development. "It's just been so hugely received. It's been unbelievable," he said. Oil prices have been stuck around the US$45 a barrel mark for weeks, around half of where they were a year earlier. The Canadian Association of Petroleum Producers has estimated 36,000 jobs have been lost in the industry so far this year, and the Alberta-owned bank ATB Financial is forecasting a recession in the province for 2015. Matchmaker Krystal Walter has been tweeting: "#oilisstilldown Doesn't mean your love life has to be." It's not part of any grand strategic plan to leverage the downturn to drum up new business, she said. She's just calling it like she sees it. "It's the truth," she said. "When the stock market is down, you love life can be and it can lead to fights and divorce. It can strongly affect all areas of your life. It shouldn't, but it does." On the revolving doors of the Barcelona Tavern, a tapas and cocktail purveyor, are signs that read: "Time to wine about oil." All bottles are 20 per cent off until oil hits US$70 a barrel weekdays between 11 a.m. and 7 p.m.
Debi Andrus, who teaches marketing at the University of Calgary's Haskayne School of Business, said those ads and promotions seem to be geared toward young professionals who may be particularly sensitive to the city's economic woes. "I look at it as it's taking a lemon and making lemonade so that it's palatable," she said. "We know that this is a reality. Let's deal with it." 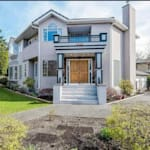 The approach doesn't work with all types of businesses, said Kendra Hart, who teaches marketing at Calgary's Mount Royal University. A financial planner making light of low oil prices, for instance, isn't likely to fly. It's more for businesses that are geared toward fun or pleasure, said Hart. "This idea of 'we're all sort of in this together' makes you feel like you're bonding with the company, they share your pain. It gives a nice little personality to the company and helps you build a relationship with it." Whether the campaigns translate into a boost to the bottom line is another matter. In January, Manuel Latruwe Belgian Patisserie and Bread Shop posted to Facebook and Twitter that it was offering bread on sale while oil was below US$60 a barrel. "Every family should be able to afford a good loaf of bread," it said. But the promotions didn't get much traction, said Latruwe, who opened the shop in 1998. "We did it for a couple of months, but we didn't see a change in sales."